KATHMANDU, Sep 12: One of the leading groups of hotel companies in world, Intercontinental Hotels Group (IHG) has selected Global Academy of Tourism and Hospitality Education (GATE) as its official educational establishment in Nepal. Until now, Hotel Soaltee Crown Plaza has been acting as official flagger of Intercontinental Hotels Group. Intercontinental Hotels Group and GATE College signed the collaboration agreement papers during a special program in Kathmandu on Friday. Under special attendance by the South Asian Chief of IHG Santa de Silva, the agreement papers were signed on the side of Intercontinental Hotels Group by the General Manager of Hotel Soaltee, Upal Majumdar, and by the founder of GATE College and CEO, Khem Lakai. 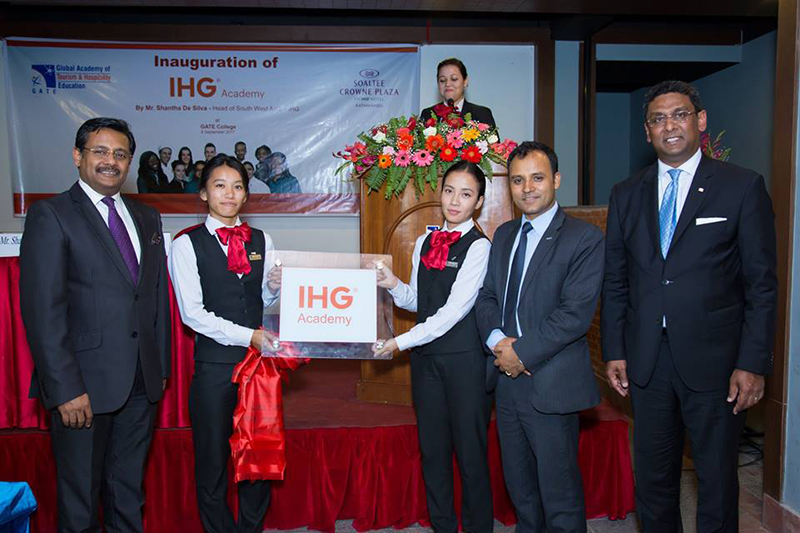 According to the agreement papers, GATE College is now the official IHG Academy for Nepal. As one of the leading hotel companies of the world, Intercontinental Hotels Group (IHG) has 5,221 hotels in around a hundred countries where it has been providing devoted service to its guests from around 7,77,675 rooms. The headquarters of IHG is in Denham, United Kingdom while it has 3,50,000 employees currently working under it. Under the brand of IHG include various other companies including Intercontinental Hotels and Resorts, Kimpton Hotels and Restaurants, Even Hotels, Hilux Hotels and Resorts, Crown Plaza Hotels and Resorts, Holiday Inn, Holiday Inn Vacations, Holiday Inn Express, Holiday Inn Resorts, Staybridge Suites and Candlewood Suites. Holding a successful 50-year-old history in Nepal, the deluxe five-star Hotel Soaltee Crown Plaza is the only flag-bearer hotel of IHG in Nepal. The hotels and corporate offices under IHG have been working through IHG Academy in collaboration with education service providers and community groups in order to create manpower in the hospitality sector and even raise its standards. Established in 2006, IHG Academy has been growing ceaselessly and has now spread to over 60 countries all over the world. Global Academy of Tourism and Hospitality Education (GATE) is a reputed education establishment of Nepal for Hospitality and Tourism courses and it has been playing an important role in the education and training of youth for professional careers in hospitality around the world. Within 10 years of establishment, GATE has successfully conducted specifically developed education programs to allow students to apply their skills in personal and professional life through practical training. GATE College is the first educational establishment in Asia to achieve a popular hospitality award, which it won in 2011 at a special program conducted in Paris, France. Furthermore, GATE College is the only college to gain affiliation with Switzerland’s reputed Swiss Hotel Association Hotelry. Through its collaboration with IHG, GATE College aims to train and grow future leaders in the field of Hospitality and Tourism and produce capable manpower in the field, aiding IHG’s fast growth and fulfilling the need of quality human development. Alongside leadership and international level opportunities, IHG will prioritize teaching the products of GATE College the ins and outs of managing premium hotels.